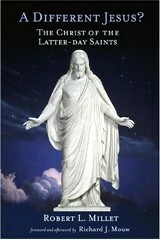 MormonInfo.org - Discussion - Mouw and Millet have the Same Jesus? I speak to you as one who almost became a Mormon, and I speak to you as someone who earnestly seeks for God to be glorified in the conversion of all Mormons. You were not wise in publishing this book. I can't help but think you have embraced Mouw's view of "dialogue", condemned the spirit of Galatians and 1 John, and sidestepped the wisdom of seasoned, in-the-trenches, day-in-and-day-out missionaries and apologists and regular laymen who interact with Mormons. Millet does not represent the normal, average Mormon. Those in the bubble of academia (Millet, Mouw, etc.) are not accurately representative of important, fruitful, Christian - Mormon interaction. Also, given the content, I don't think it was very honest or genuine to say the book is merely informative. It was written to be persuasive, and with Mouw saying that Millet is probably a genuine Christian, something honestly persuaded Mr. Mouw. I ask you earnestly to retract this book. Seek counsel from the crucible of Christian wisdom, not excluding yourself to those who scratch your ears. Contact Russ East from Utah Partnerships for Christ, a missionary in [Ogden]. Contact Rob Sivulka from MormonInfo.org, a Salt Lake City missionary. Contact Timothy Oliver from Watchman Fellowship (thinkabouteternity.com). Given the current situation I cannot in good conscience buy your books. I will warn my beloved brothers about this situation, lest they be lead astray from the New Testament spirit toward those who promote false Christs. You have figuratively invited them into your house, which according to John "takes part in his wicked works" (2 John 1:11). Even though you are not guilty of being a Mormon, you are guilty with the Mormons for promoting their deceitful doctrine and their unhelpful (but superficially attractive) methods of "dialogue". Trevin Wax's review of Mouw's "Talking With Mormons"